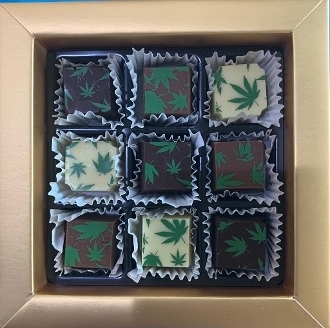 AVAILABLE IN FLORIDA ONLY; CBD married to our delicious chocolate! And then decorated with an adorable hemp leaf! This box contains 9 squares of solid chocolate each containing 15mg of pure tasteless Hemp CBD for a total of 135mg of CBD per box. No THC. So relax while enjoying our amazing chocolates! The CBD used in our products is made from NON-GMO, PESTICIDE FREE, CO2 Extracted Industrial Hemp Oil, and is third-party tested for purity. CBD is non-psychoactive. Each assortment is available in all dark chocolate, all milk chocolate, all white chocolate or an assortment. The Chocolate Spectrum’s CBD products have not been evaluated by the Food and Drug Administration (FDA). The products are not intended to diagnose, treat, cure, or prevent any disease. We recommend consulting with a qualified medical doctor or physician when preparing a treatment plan for any and all diseases or ailments. The Chocolate Spectrum does not make any health claims about our products and recommends consulting with a qualified medical doctor or physician prior to consuming our products or preparing a treatment plan. It is especially important for those who are pregnant, nursing, chronically ill, elderly or under the age of 18 to discuss the use of these products with a physician prior to consuming. You must be 18 years or older to purchase The Chocolate Spectrum’s CBD products. The information on our website is intended to provide general information regarding our products and is not to be construed as medical advice or instruction.